Ten years ago, producer Jerry Bruckheimer and director Jon Turteltaub got together with the Disney Studios and created an adventure/heist that delved deeply into American history . . . namely the American Revolution called “NATIONAL TREASURE”. The movie begins in 1974, when a ten year-old Benjamin Franklin Gates searches for relics inside the attic of his grandfather John Adams Gates’ Washington D.C. home. Heartened by his grandson’s enthusiasm, old Mr. Gates reveals a family legend about valuable and ancient treasures that had been gathered since Ancient Egypt. When the treasure falls into the hands of the Freemason during the American Revolution, the Founding Fathers go out of their way to hide it from the British. They left one clue – a scrap of paper with the inscription, “the secret lies with Charlotte” – in the hands of their colleague Charles Carroll of Carrollton, Maryland. The latter tries to deliver the clue to President Andrew Jackson, but gives it to his driver, an adolescent named Thomas Gates, who happened to be an ancestor of Ben’s family. 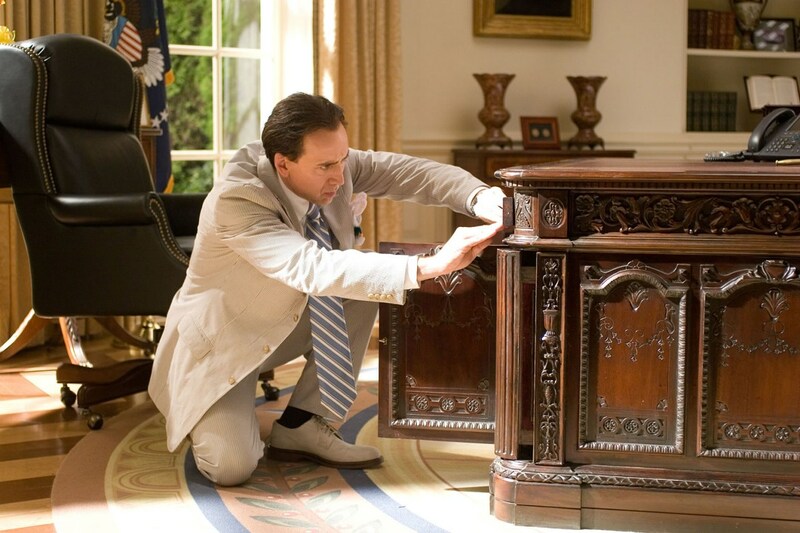 Although his father Patrick Gates disapproves of treasure hunting, Ben becomes obsessed with the “National Treasure”. Nearly three decades later, Ben (who is now a historian and amateur cryptologist) recruits a young computer expert named Riley Poole and Ian Howe, a wealthy British financier, to search for the Charlotte. The three men, along with Ian’s employees, find an old eighteenth ship called the U.S.S. Charlotte trapped in the Arctic ice. Instead of the treasure, Ben discovers a meerschaum pipe hidden in a barrel of gunpowder in the cargo hold. An engraved riddle is found on the pipe’s stem, which Ben believes is a clue to an invisible map written on the back of the Declaration of Independence. When Ian reveals his criminal past and willingness to steal the Declaration of Independence, he and Ben have a falling out. Upon their return to Washington D.C., Ben and Riley try to warn various Federal agencies, including one Abigail Chase of the National Archives, but no one believes them. The pair decides that the only way to prevent the Declaration from getting into Ian’s hands is to steal the document themselves. This decision leads Ben, Riley and eventually Abigail on adventure that takes them from the nation’s capital to New York City’s financial center in an effort to find the treasure and prevent it from falling into Ian’s hands. “NATIONAL TREASURE” received mixed reviews when it first hit the theaters ten years ago. On a certain level, I can understand. The idea of a treasure map on the back of the Declaration of Independence sound rather ludicrous. Even more ludicrous is the idea of a pair of pair of spectacles with multiple colored lenses hidden behind an Independence Hall brick and used to read the “hidden map”. But the most ludicrous aspect from the screenplay written by Cormac and Marianne Wibberley, Ted Elliott, and Terry Rossio is the fact that Ben and Riley did not face criminal charges for stealing the Declaration of Independence in the first place. If I had been Ian Howe, I would have sued the F.B.I. Also, “NATIONAL TREASURE” did reek with the whole “Disneyanna-style” of American History that you can find at the corporation’s various amusement theme parks. The history depicted in the film seemed more intent upon putting the Founding Fathers on a pedestal, instead of engaging in a more realistic exploration of American history. This beautification of history is reflected in a good deal of star Nicholas Cage’s dialogue. On the hand, “NATIONAL TREASURE” did reveal some nice tidbits of American history, especially from the Revolution period. Even the Riley Poole character managed to put in his two cents in one scene that I found particularly humorous. Speaking of humor, I cannot deny that I found the movie rather funny. I wonder if this could be attributed to Ted Elliott and Terry Rossio being two of the movie’s screenwriters. After all, they were responsible for a great deal of the humor found in the “PIRATES OF THE CARIBBEAN” movie franchise. Although most of the cast managed to get in a few funny lines, a good deal of the humor came from the exchanges between Nicholas Cage and Justin Bartha. Once Diane Kruger’s character joined the search for the treasure, a very funny and dynamic trio became complete. But the best aspect of “NATIONAL TREASURE” proved to be its story. The screenwriters did a first-rate job in combining the many aspects of the movie’s plot – adventure, comedy, historical mystery and heist film. And they managed to combine these aspects in a seamless manner that still astounds me to this day. No wonder I find this movie so enjoyable to watch . . . even after a decade. Also responsible for the movie’s visual style was production designer Norris Spencer, who did an excellent job of combining the movie’s current day setting and the historical flashbacks. William Goldenberg did a more than admirable job with the film’s editing. This was especially apparent in certain action scenes like the original heist at the National Archives, the van chase in Washington D.C., the foot chase in Philadelphia and the tunnels beneath Trinity Church in New York City. Aside from the movie’s narrative, my favorite aspect of “NATIONAL TREASURE” proved to be the performances by the cast. I do not know if I would regard Benjamin Gates as one of Nicholas Gates’ best roles. But it is certainly one of my favorites. What I liked about Cage’s performance is that he injected so much energy and passion into the role that in many ways, he reminded me of why I enjoy History so much. On the other hand, Justin Bartha provided an entertaining contrast to Cage’s passionate historian with his witty and sardonic dialogue. I also enjoyed how Bartha’s Riley Poole seemed to project a long-suffering attitude toward Ben’s occasional over-the-top passion for History. “NATIONAL TREASURE” was the first time I saw Diane Kruger in any production – movie or television. I realized that ten years ago, most critics did not have a high opinion of her. I never understood why. Not only did she give a very charming and skillful performance as Abigail Chase, the National Archives historian who gets dragged into Ben and Riley’s treasure hunt, she clicked very well with both Cage and Bartha. I have seen Sean Bean in just about every kind of role possible – as a hero, an anti-hero, a pathetic dweeb and finally as a villain. I have to say that Ian Howe has to be one of the most interesting . . . and likable villains he has ever portrayed. I liked how Bean not only conveyed the villainous aspects of his character, but also Howe’s friendliness, intelligence, subtlety and loyalty to his men. Jon Voight gave a surprisingly complex and interesting performance as Ben Gates’ skeptical historian father, Patrick Gates, who enthusiasm for treasure hunter declined to the point of cynicism. Voight provided a good deal of give-and-take not only for Cage, but also Christopher Plummer, who portrayed his father, John Gates. Speaking of Plummer, his appearance in the movie was brief, but also very entertaining and memorable . . . at least for me. I thought he did a pretty good job in setting up the film’s narrative with his verbal description of the Templar treasure. 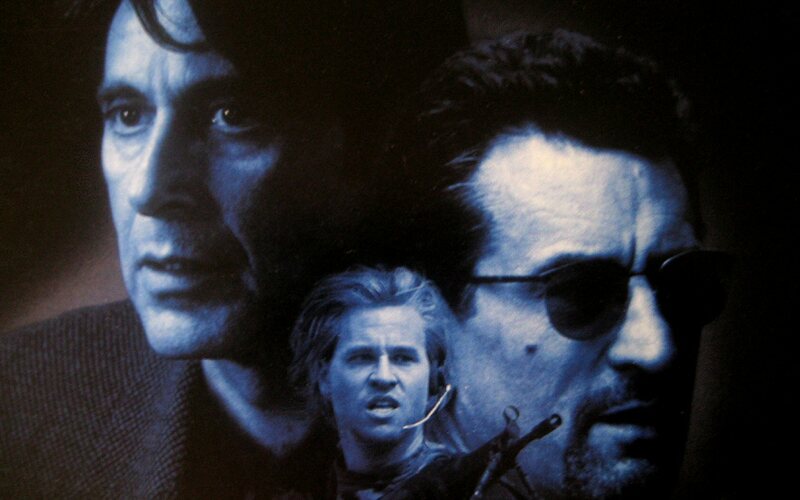 Harvey Keitel surprisingly proved to be the movie’s backbone as the no-nonsense F.B.I. Special Agent Peter Sadusky. He gave a quiet, grounded and slightly sardonic performance that proved to be rather comforting. “NATIONAL TREASURE” also featured solid supporting performances from the likes of David Dayan Fisher (“24”), Mark Pellegrino (“LOST”), Stephen Pope, Oleg Taktarov, Ron Canada (“THE WEST WING”), Annie Parisse (“THE PACIFIC” and“PERSONS OF INTEREST”), Dahn Ballard, Yves Michel-Beneche and especially Sharon Wilkins, who was hilarious as a sarcastic female butcher at Philadelphia’s Reading Terminal Market. What else can I say about “NATIONAL TREASURE”? It is not perfect. And there are times when the plot came off as illogical. But after ten years, I believe it is one of the more entertaining live-action Disney movies I have ever seen. And I have to thank director Jon Turteltaub, a talented crew and first-rate acting from a cast led by Nicholas Cage. Three years ago, two movies were released in the theaters . . . two movies that could not be anymore different than if they had tried. I am speaking of “NATIONAL TREASURE 2: THE BOOK OF SECRETS” and “CHARLIE WILSON’S WAR”. The first movie, starring Nicholas Cage and Jon Voight, is a sequel to the 2004 Disney film, “NATIONAL TREASURE”. The other is a comedy-drama about a Texas congressman from the 1980s who found himself involved in Afghanistan’s attempts to free itself from a Soviet invasion. This sequel to the 2004 movie – “National Treasure” – opens with the Gates family – Benjamin and Patrick (Nicholas Cage and Jon Voight) – learning from a black market dealer named Mitch Wilkinson (Ed Harris) that their Civil War ancestor Thomas Gates (Joel Gretsch) may have been the mastermind behind Abraham Lincoln’s assassination. Wilkinson’s so-called proof came from assassin John Wilkes Booth’s diary. To prove their ancestor’s innocence and family honor, Ben and Patrick recruit the aid of family friend Riley Poole (Justin Bartha), Ben’s estranged girlfriend Abigail Chase (Diane Kruger), Patrick’s ex-wife Emily Appleton (Helen Mirren), FBI Agent Sadusky (Harvey Keitel) and even the President of the United States (Bruce Greenwood) to help them find the treasure of gold that would vindicate Thomas Gates and the family’s name. In a nutshell, this sequel turned out to be just as fun and exciting as the first movie. Ben Gates and company follow clues that lead them from Paris to London to Washington D.C. and finally Mount Rushmore in the Dakota Black Hills. The cast were their usual competent selves and Ed Harris turned out to be just as effective as a villain as Sean Bean had been in the first film. My favorite sequences included Ben, Abigail and Riley’s attempt to gain access to one of the rooms at Buckingham Palace, Ben and Abigail’s minor adventures at the White House and Ben’s kidnapping of the President at Mount Vernon. I did have a few problems with the movie. My biggest gripe turned out to be the treasure itself. I realize that the Templar treasure found in the first film could not be topped. But I must admit that the City of Gold found beneath Mount Rushmore had failed to impress me at all. And why end the movie at Mount Rushmore? Granted there was a war between American settlers and the Dakota Sioux in 1862, but what did that have to do with the Civil War? I would have been happier if the movie’s setting had remained on the East Coast. Aside from these minor gripes, “National Treasure 2: The Book of Secrets” turned out to be as entertaining as the first film. I would highly recommend it. This historical drama told the story of recently departed Texas congressman Charles Wilson (Tom Hanks)’s efforts to get the United States to aid the Mujahideen (Afghanistan freedom fighters) in their fight against the military invaders from the Soviet Union during the 1980s. Urged on by his staunchly anti-Communist friend and romantic interest, Texas heiress Joanne Herring (Julia Roberts), Wilson became deeply involved to help the Afghans throw the Soviets out of their country without the world knowing about U.S. involvement. The film not only revealed Wilson’s growing disdain for the Soviet occupation of Afghanistan, it also gave moviegoers a look into his gregarious social life of women and partying. Judging from the movie’s Golden Globe and Screen Actors Guild nomination, one could see that “Charlie Wilson’s War”has become a front-runner for Academy Award nominations. Does it deserve the acclamation? I do not know. Granted, Mike Nichols did a competent job in allowing moviegoers a peek into Washington and international politics, and C.I.A. policies. 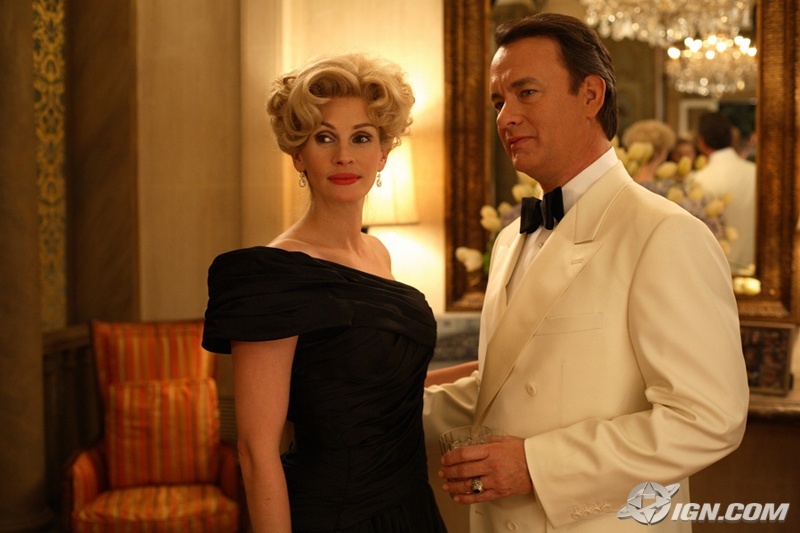 Tom Hanks, Julia Roberts and Philip Seymour Hoffman (as C.I.A. operative Gust Avrakotos) were excellent. But if I must be honest, the movie did not give me a charge. I liked it. I really found it entertaining. But I did not love it. When leaving the theater, I had this feeling that something was missing. It could have been the unsatisfying ending, which I found to be rushed. Or perhaps I thought the story could have required a little more depth. I cannot say that “Charlie Wilson’s War” was great. But I did find it entertaining. And if you are intrigued by a look into American politics during the 1980s, I would highly recommend it.